Continuing my quest to make things I doubted I could—pie crust, pizza dough, pickles—my thoughts recently turned to jam. I’ve always been a bit freaked out by the boiling and the sealing process. But unless you’re planning on keeping that jam for months at a time, sterilization is unnecessary. If, like me, you eat half a jar of delicious jam with scones for lunch, you’ll have no problem using it up quickly. Laena Mira, founder and CEO of jam company Anarchy In A Jar, assures me that home cooks need not worry about sterilizing jars unless they want to make their jams shelf-stable. Perhaps this is something I’ll revisit when everyone gets raspberry-mint-vanilla jam for Christmas next year, but for my initial outing, I’m skipping the sterilizing (this also helped make my pickle process considerably easier). For my first time jamming, I decided on strawberry jam with a huge dose of vanilla. My next big decision: Pectin or no? As Mira explains, pectin is a gelatinous “natural element of plants.” Some fruits, like lemon and apples, have a higher concentration of pectin than berries. The French, Mira tells me, make a pectin jelly out of unripe apples and use it in their jam. Forgoing pectin, I spent a ton of time waiting for my jam to set. Mira explained jelling happens through a chemical process as the liquid cooks. This all happens at 212 degrees Fahrenheit, or the “gel set” mark that makes jam “jam.” Beaven says she sometimes uses a thermometer, or the simple “wrinkle test” to determine whether a jam has set. For the wrinkle test, put a plate in the freezer for about 15 minutes. Then put a teaspoon of hot jam on it. Push your finger through the jam on the plate (taking care that it’s not too hot). You want the area where your finger swiped through to be a wrinkle, not to have the fruit fill that space back in. My jam was pretty simple: 2 pounds of strawberries, 1/2 cup sugar, and about a tablespoon of vanilla extract. But when my strawberries appeared to have a hard time jelling, I added about a 1/4 cup of lemon juice to add pectin, which definitely had a beneficial effect on bringing my jam together. Adding all that sugar made my jam, “jam,” according to Mira. Technically the term “jam” requires the concoction contains 55% sugar, including the sugar in the fruit. That’s why at the supermarket you’ll find “sugar-free” fruit spread, or preserves, but not jam, because it’s a product with a specific description. However, Mira thinks I made a misstep by using fresh fruit; she says that frozen fruit is better to use for jam than the produce in the grocery store. “Those strawberries were picked when they were still green. That’s why there’s so much white in the middle” whereas frozen fruit has been picked once ripe, lending a deeper flavor. Okay, next time. Nevertheless, my jam was delicious, a definite testament to the fact that homemade usually exceeds store-bought. This despite the fact that the vanilla appeared to be swallowed up completely by the flavor of the berries. Next time, I will get a bit more creative. Mira’s own jam company makes products like Grapefruit And Smoked Salt Marmalade and Strawberry Balsamic Jam. She suggests other strawberry-friendly flavors like black pepper, lime rind, or jalapeño peppers. 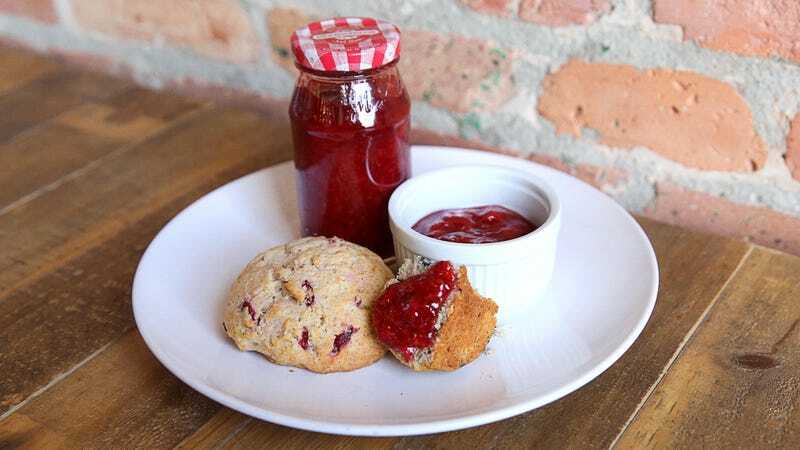 You can either add the flavors right to the jam (like grinding some black pepper right in there), or put them in a little cheesecloth bag or tea ball to add flavor without texture. So many possibilities! Beaven advises, “Start small to get familiar with the process and then scale up once you get the hang of it. It’s not complicated it’s simple if you follow a few simple rules… do not over complicate it.” After that, there’s no limit to the kind of jam you can make. To start out, below is a recipe from the book that Beaven co-authored, in which you can use any combo of red fruits you like (note that this is a sterilized version, however). Sometimes you have small amounts of several fruits; sometimes you just don’t want a one-fruit jam. This jam is worth making whatever the reason… a jewel of a jam, sparkling red like Dorothy’s slippers in The Wizard Of Oz. Pit the cherries. Put half of the pits in a muslin bag and add to a saucepan along with strawberries and red currants. Spread sugar evenly on a baking sheet and heat on its own in the oven for 4 minutes. Add the warmed sugar to the fruit, stir until dissolved, and bring to a rolling boil. Boil for 8 to 10 minutes, until the setting point is achieved. Remove the bag of pits. Skim off any scum that may have formed. Pour fruit mixture into jars and seal immediately. Keeps for one year unopened. Once opened, refrigerate and use within three months. Note: You can use any combination or ratio of red fruits. Swap sour for sweet cherries, or use raspberries, cranberries, or pink gooseberries. Think about how sweet the combination will be and adjust the sugar accordingly. Reprinted with permission from Do Preserve by Anja Dunk, Jen Gross, and Mimi Beaven by Chronicle Books, 2019.